Back in the fall of 2010, the Blue Chair Jam Cookbook arrived full of inspiration for turning all sorts of fruits into jams and preserves. At the time, I made the Candied Orange Peel that I ended up using in everything from panettone to chocolate bark candy. Last fall, a new book from Rachel Saunders arrived, Blue Chair Cooks with Jam and Marmalade , and I received a review copy. This time, all those wonderful preserves are added to recipes both sweet and savory. They add flavor, sweetness, sometimes acidity, and texture incorporated as ingredients, paired with other items, and even in cocktails. For the most part, the recipes here are just for the dishes made with jams and marmalades, but there are instructions for making a few of the preserves as well. The book is divided into chapters by Morning, Afternoon, and Evening. There are breakfast dishes like Black Fig and Cacao Nib Belgian Waffles made with Black Mission Fig jam and Buckwheat Muffins with Pear and Chocolate made with Pear Jam. For Afternoon, you’ll find Beet Soup with Plums and Coriander Yogurt with sweetness from Plum Jam to balance the earthy beets. And, for Evening, the Black Beans and Pumpkin with Chiles and Orange that includes some Seville Orange Marmalade got my attention. I kept turning back to the Beet Salad with Walnuts and Kumquat Marmalade recipe because the yogurt dressing for grated beets sounded like a great match. This time of year, it’s easy to find gorgeous beets and kohlrabi at the farmers’ markets, and I also found the green onions for this recipe there. I used golden beets which blend better into a salad like since red beets would turn everything pink. The beets were roasted with whole cloves until cooked through but not too, too tender. Once cool, the peels were slipped off, and the beets were grated. Meanwhile, I peeled and grated some kohlrabi and tossed them with salt. The salted, grated kohlrabi was left to drain in a colander for about 20 minutes. 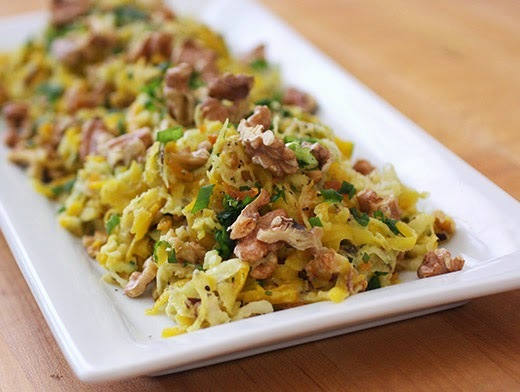 The drained kohlrabi was combined with the grated beets, and toasted walnuts were added with chopped mint. The dressing was made by mixing together kumquat marmalade, champagne vinegar, yogurt, minced green onions, and salt. The recipe advises against Greek yogurt, but that was what I had on hand. The dressing was poured over the vegetables, tossed to combine, and I topped the finished salad with some reserved walnuts and chopped green onions. The sweet-savory-tangy flavor of the dressing was a hit. As I tasted the yogurt dressing while making it, I imagined stealing this combination to use for chicken salad with walnuts. And, the fruitiness paired perfectly with the beets and kohlrabi. The salad was like slaw but a special-occasion kind of slaw. As with the last book from Blue Chair Jam, there’s a lot of inspiration to be found here. My next use of beets might just be to turn them into a marmalade as seen in the book. Recipe reprinted with permission from Blue Chair Cooks with Jam and Marmalade by Rachel Saunders, Andrews McMeel Publishing 2014. This sweet salad celebrates everything beets have to offer: beautiful color, luscious rich flavor, and the ability to combine well with numerous different textures and ingredients. This extremely versatile salad is equally at home on the tea table or as part of a Middle Eastern meal, and handfuls of the leftovers are divine tossed into a green salad or piled into a sandwich. 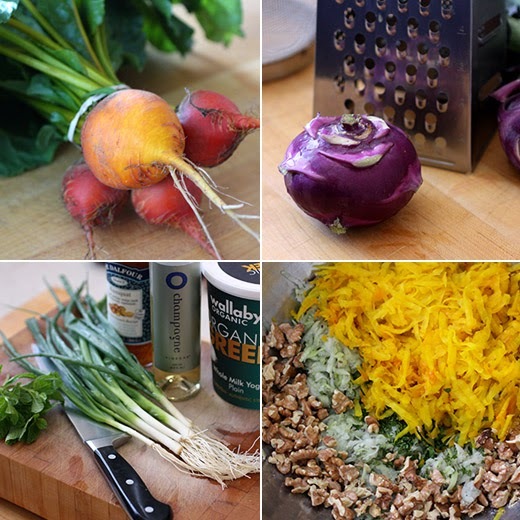 Use golden or dark red beets as you prefer. This salad keeps well for at least a week in the refrigerator. Position a rack in the middle of the oven and preheat the oven to 425°F. Scrub the beets and pat them dry. Line a baking sheet with a large sheet of aluminum foil and put the beets on the foil. Drizzle liberally with olive oil and sprinkle with ample salt and pepper. Toss well. Scatter the cloves over the beets. Cover the beets with a second large sheet of foil and pinch the edges of the 2 sheets together to seal. Place the beets in the oven to roast until almost but not quite tender, 30 to 60 minutes (the length of time needed will be determined by the size of the beets). Remove the beets from the oven, loosen the top sheet of foil so steam can escape, and let the beets cool to slightly warm. Trim and peel them and coarsely grate the beets into a large bowl. While the beets are baking, coarsely grate the turnips into a colander. Toss them with 1/4 teaspoon salt and place the colander over a bowl. Allow the turnips to drain for 15 to 20 minutes. Add the drained turnips to the grated beets and toss well, then add the walnuts and lemon balm, if using. In a glass measuring cup, whisk together the marmalade, vinegar, yogurt, shallots, and 1/2 teaspoon salt. Pour the dressing over the beet mixture and toss well. Adjust for seasonings, toss again, cover, and refrigerate until serving time. This sounds like a cookbook I need to get!! Such a pretty colorful salad. I love beets! A fabulous salad and creation! So tasty, healthy, unique and refined. I just cooked some beets! That looks so delicious and full of nutrition, I will try it today. I love beets! Never thought to pair them with a kumquat marmalade though. Sounds terrific! Really nice -- thanks. Wish I could find some golden beets! This looks marvelous. Love that kumquat dressing. What a combination of flavors Lisa. The salad looks so bright for this time of year. Unfortunately, I haven't been able to find any decent beets at the grocery yet. I'll sure keep a look-out though. I adore that the dressing recipe uses marmalade. I often have a few tablespoons of jam lingering in the refrigerator. 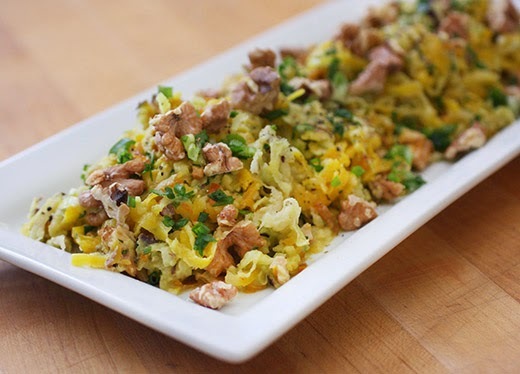 This would be a great way to use up the leftovers! You always showcase the most interesting cookbooks! This one sounds great, and your beet salad is gorgeous. What a great salad, Lisa. I bet a lot of people have never even served kohlrabi and some don't even know what it looks like; my mother did, so I know what it is and what it tastes like. Be a great combo with the roasted beets. The kumquat marmalade sounds good too...I used to put a bowl of kumquats out at Christmastime...my granddaughter (who was 2 or 3 at the time) would come along and bite each one. Little teeth marks on all the kumquats! This is my kind of salad Lisa, I tried kohlrabi this year for the first time and loved it. Great recipe! What a great salad! The texture alone looks marvelous... I can only imagine the taste :) Thanks for sharing, Lisa. This salad is everything I love and nothing that I don't enjoy. Even the dressing makes me swoon. What an amazing salad, Lisa! I love each ingredient! So good! I love anything with kumquats in it. This salad looks so gorgeous with its many textures and colors. Can't wait to try it.